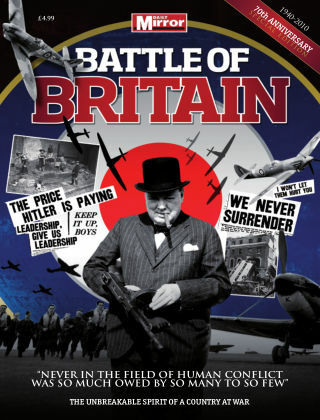 With Readly you can read Battle of Britan and thousands of other magazines on your tablet and smartphone. Get access to all with just one subscription. New releases and back issues – all included. “Never in the field of human conflict was so much owed by so many to so few.” With these famous words, Prime Minister Winston Churchill saluted the heroism of the pilots who defended the nation during the Battle of Britain. Spitfi res, Hawker Hurricanes and Nazi Messerschmitts circled the skies above Britain and fought during the summer of 1940 as the Germans attempted to bomb the country into submission. Thanks to the bravery and brilliance of the pilots, and the defiance of the British people, the enemy were repulsed and the threat of invasion averted. Packed with rare and unseen images from the magnificent Daily Mirror archive, and featuring Mirror pages and reports from the time, this special publication marks the 70th anniversary of the conflict and celebrates what “The Few” achieved on our behalf.